As stoneware potters go, Absalom Stedman wasn’t the most colorful (practically nothing is written about him), nor the most prolific (his pots never seem to have made it into pottery history books). Absalom made salt-glazed, incised, cobalt decorated stoneware in New Haven, CT during the 1820s -30’s. But he was capable enough to do some fine work, at least now and then. The three gallon jug to the right is proof of that last comment. Absalom threw this jug sometime between 1825-30. Its steady and purposeful form speaks to a lifetime of confidently pursuing the potter’s craft. The jug is a beautifully proportioned masterpiece of early American stoneware. 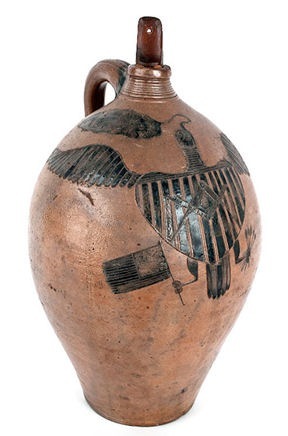 The jug is adorned with an incised eagle with shield and Masonic symbol, clutching an American flag and arrows in its talons. The shielded eagle was a popular motif of the time. But potters – and many others – hadn’t yet worked out the details of their young country’s icon. Many eagle depictions were awkward and clumsy (then again, some potters just weren’t that good of draftsmen). But this sprawling bird gracefully wraps itself around the jug’s shoulder, occupying the space in a most successful manner. On May 5th, 2012, Absalom’s jug came up for auction by the antiques dealers Pook and Pook. The winning bid: $402,900.00. This was a world record for 19th century American stoneware. Absalom Stedman, where are you now? 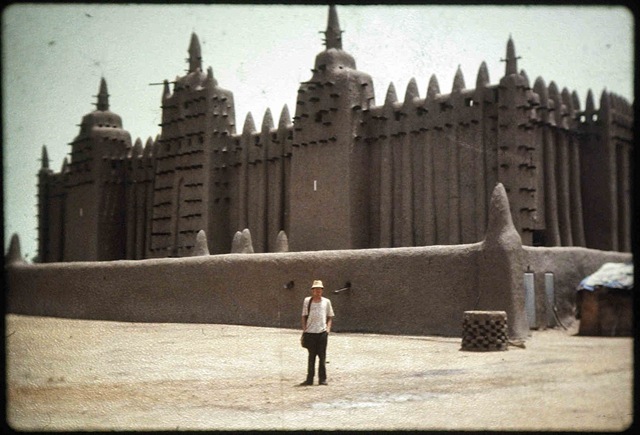 Anglo-American Ceramics, Part 1. Transfer Printed Creamware and Pearlware for the American Market, 1760-1860. David and Linda Arman. Oakland Press/Portsmouth, RI. 1998. You are currently browsing the archives for the Absalom Stedman category.